This is one of my favourite salvias because it is pretty, a small plant and highly useful medicinally. It is Chinese in origin where they to use so many plants in natural remedies and this has major uses to do with blood. 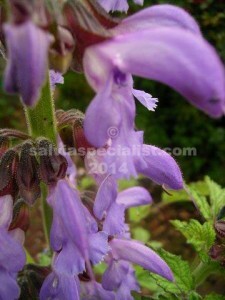 It is often called red rooted salvia but it is not the only salvia that has red roots. The root is the part with the most health giving properties, no doubt all the good stuff is stored there. If you look on the internet there is a lot of information about its medicinal uses for heart and kidneys. A medication made from salvia miltiorrhiza etc is almost through all the tests to be able to sell it in the U.S. as a regular medication, not just through health food companies. Miltiorrhiza goes down to a bit of new base foliage through winter, getting ready for a burst of life in spring. The foliage is divided giving it a ferny appearance. Flowers are a good size usually in mauve shades held on spikes coming from the base. It is only in the last 20 years that seed has been obtainable reasonably readibly and that is worldwide. There would be no easy commercial source of seed in Australia. It sets some seed for me so the possibility is there.